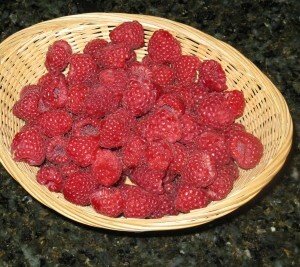 There is nothing like a fresh raspberry right from your very own yard. Feeling intimidated, though, about your likelihood of success with the berries? Come to the Gardens and learn from the pros and you can be picking your first raspberry before you know it. The easiest path to raspberry growing success is to grow the fall types. These turn a normal second year bearing plant into a plant that will grow and fruit in one year. What a relief once-a-year spring pruning is to someone who has wrestled with removing spent two year canes from among one year canes with traditional second year bearing (summer type) varieties. Canes are prickly with thorns after all. Each spring following the previous year’s crop, simply cut all canes of fall types to the ground before new growth begins. Don’t cut in fall as this wastes energy stored in the canes before the plant has a chance to move it to the crowns in early winter. Recommended fall types to plant in April are yellow-fruited ‘Anne’ and ‘Fall Gold’, and the red fruited ‘Autumn Britten’, ‘Polana’, ‘Heritage’, ‘Jaclyn’, Himbo-Top’ and ‘Caroline’. Make sure to buy virus-free planting stock of named varieties. Choose a full sun location with some late afternoon shade. Amend soils before planting or bring improved soil in to a raised bed to insure drainage. Plants survive but fruit poorly in unimproved clay soils. Plan to regularly irrigate with drip irrigation for both water efficiency and to control root suckering. Raspberries are a ten year and out crop. Inevitable accumulation of aphid-transferred viruses decreases production and fruit quality making replacement with new plants necessary. And whatever you do, don’t accept root sucker divisions from a well-meaning neighbor or friend. Plants will not be virus-free and aren’t worth your gardening investment. If you're ready to learn more about how to successfully grow your own berries, join Garden instructor, Carl Wilson, for Berries and Grapes for the Front Range on Tuesday, May 21 from 6-8 pm. Come find out the types of berries that do well in our climate and soil, what varieties are recommended, where to purchase and how to manage and prune for best results. Grapes for our area are also discussed. Carl is a garden writer and retired horticulturist from CSU Extension who regularly teaches classes at the Gardens. Find more information about growing fruit as well as vegetables on his Front Range Food Gardener blog.